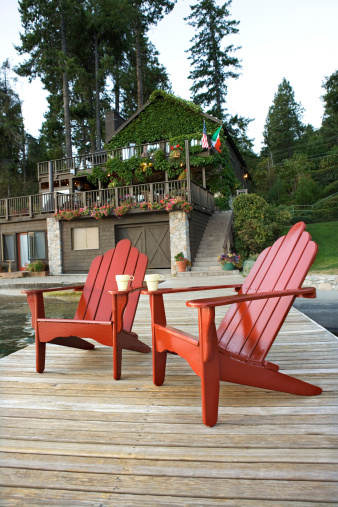 Cedar is widely considered to be one of the most desirable woods for outdoor deck or fence construction. Both its beauty and natural resistance to rot and decay make cedar an optimal choice for outdoor projects. Although cedar woods contain preservatives that are harmful to decay-causing fungi, they must be maintained. Special attention must be paid to outdoor posts, the weight-bearing portions of most decks and fences, to ensure they are properly weatherproofed. Test for absorption. Before sealing cedar posts, be sure to complete a water test. Proper water testing will ensure the wood is ready to accept protecting sealants. Simply sprinkle water on the surface of the wood. If it soaks in, the post should be sealed. If the water beads up or stands on the surface, the posts do not need to be sealed. Applying protectant too early leads to inadequate absorption, while applying too late leads to premature degradation of the cedar. Water testing will ensure proper timing. Sand rough surfaces. If you have any rough spots on the posts, simply sand the surface until smooth. Using a high grit paper, work in the direction of the wood grain to avoid unsightly marks. Clean the wood. Before applying wood protector, the cedar should be cleaned. Commercial wood cleaners, which can be found at most home improvement stores, effectively remove stains and mildew. If you would like to make your own home cleaner, however, simply mix one part bleach and some powdered detergent with two to four parts water. Scrub the posts with the cleaning solution and rinse well. Let the wood dry for one or two days before applying protectant. Apply protectant. Protect cedar posts with a sealant that repels water, prevents fading, and resists mildew. Simply paint the sealant on the posts with a brush. Use long, overlapping strokes in order to assure thorough coverage. Do not apply more protectant than the wood will absorb, however, as the excess will leave a shiny area on the surface. Finish posts by applying stain or paint. Avoid oil and latex based solid-color stains, as they create an unsightly film on cedar surfaces.